Debussy liked Spanish music, often himself composing works exhibiting elements of that nationalist style. Ibéria, the second of the three orchestral Images, is one of several examples divulging this tendency. 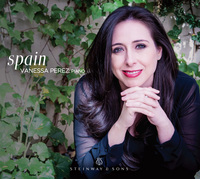 La Puerta del Vino (The Gate of Wine) is another, but it goes deeper than just evocations of Spanish musical styles, expressing the conflicting elements of love and violence as revealed by the composer. Still, the music is mostly light, its inspiration coming from an image on a postcard sent by Manuel de Falla to Debussy that depicted the Alhambra Gateway in Granada, the gate referenced in the work's title. Despite the composer's comments about violence in this piece, most listeners will hear its music as exotic and seductive, nocturnal and mysterious. This is a habañera, whose infectious rhythmic manner and thematic workings in the middle register and bass impart a sensual character to the piece. In the middle section, the music briefly takes on an epic character, but then returns to the more subdued manner from earlier. The insistent, mostly lazy rhythm often suggests sinister elements, especially in that grandiose passage in the middle section. This work typically lasts about three minutes.